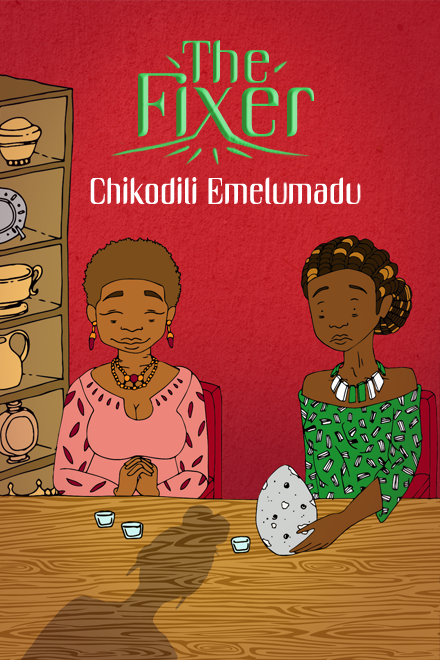 Chikodili Emelumadu is a writer, journalist and broadcaster living in London. Her work has appeared or is forthcoming in Apex , Eclectica , Omenana , One Throne and Luna Station Quarterly . She can be found ranting about life, Igboness, and whatever else seizes her fancy on Igbophilia.wordpress.com. She is currently behind you. Onyinye Iwu is a full-time design educator, the Illustrator and designer behind Ankarapress.com, she writes and illustrates children's books. Follow her on Twitter and Instagram @onyinyestudio. "Faber Wine" appears courtesy of the artist, Prince Chijioke Mbanefo, one of the most successful songwriters and artists of the 1990s in the US and Nigeria. According to the artist, "Every one of my tracks has had a point, some kind of message. The underlying question on my albums is the poor versus the rich, money, power, evil versus good and fame versus love. Which will you choose? It's really a question of choice. I want people to question how they live their lives. I'm showing them the pros and cons of both sides." Content warnings appear in the FAQ above and may contain spoilers.